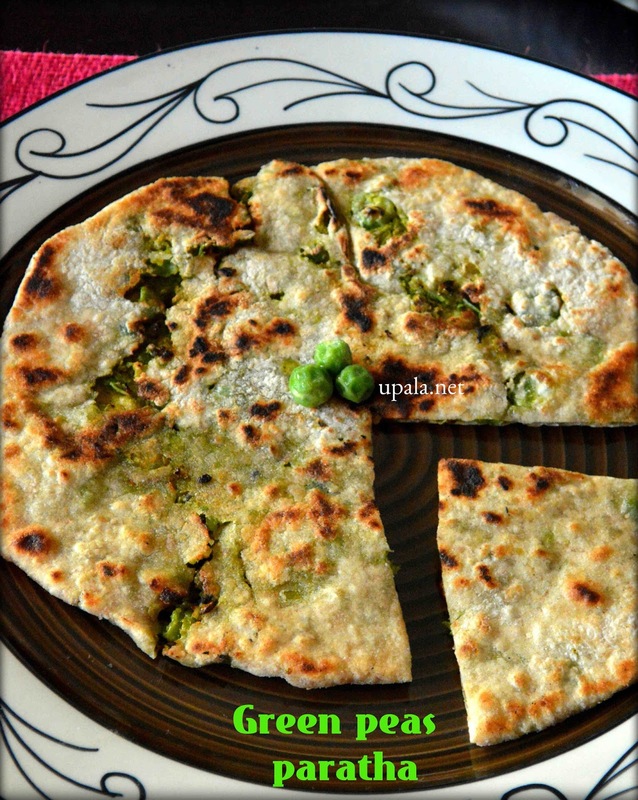 Matar ka paratha/Green peas parathais a tasty paratha prepared with delicious and nutrition rich Green peas. Fresh Green peas are available in winter as it is a winter crop and frozen ones are available any time. 1) Add enough water to matar and boil for few minutes till it gets cooked but doesn't lose its shape. 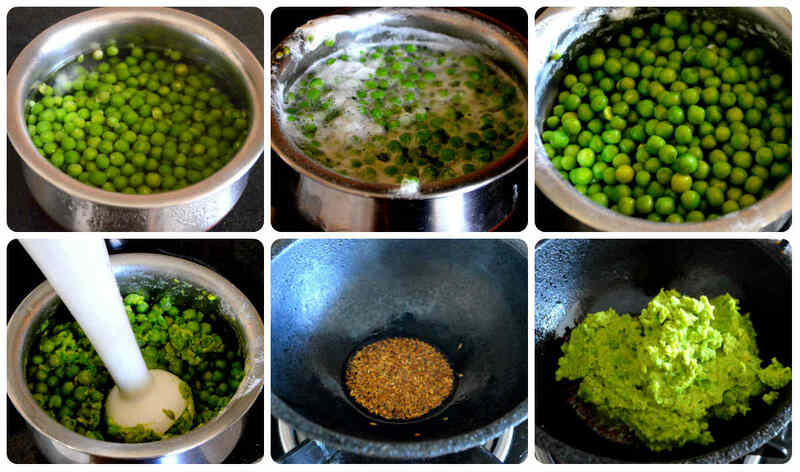 2) Drain water and set aside cooked peas to cool down for few minutes. 3) Now, grind the peas to a coarse paste. I used blender, you can also do it with a mixer. 4) Heat 2 tbsp of oil in kadai and add Cumin seeds to crackle. 5) Now add peas paste and mix well. 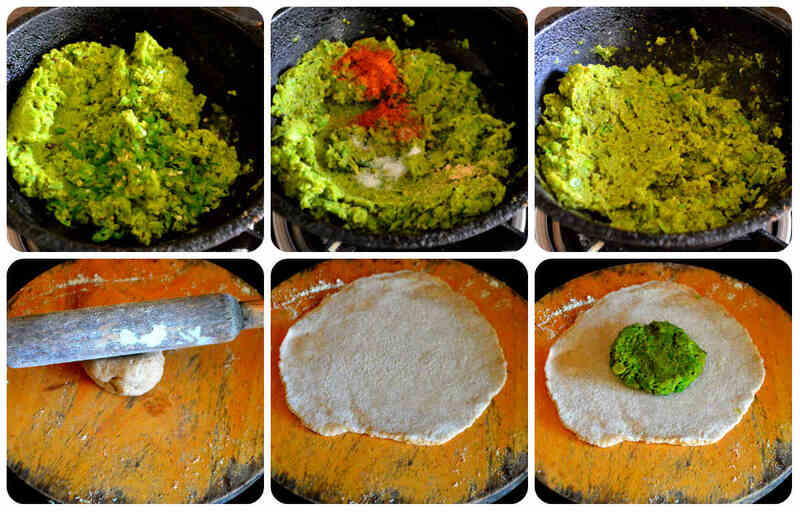 6) Add green chillies, Garam masala, amchur powder, salt and mix well. Let it cook for 2 mins, switch off the flame and leave it to cool down. 7) Mean while, add salt and 1 tbsp oil to atta/wheat four and knead it to a soft and smooth dough. Make equal size dough balls and cover it. 8) Make equal size matar balls for stuffing. 9) Take one atta ball and roll it over rolling board. Now pat one matar ball, keep it inside and close it as shown in the picture. Seal the edge and pat it gently. 10) Now roll it again by dusting some flour. 11) Heat a tawa and put the paratha to cook in medium flame. 12) After one side is cooked, flip it around to cook other side. 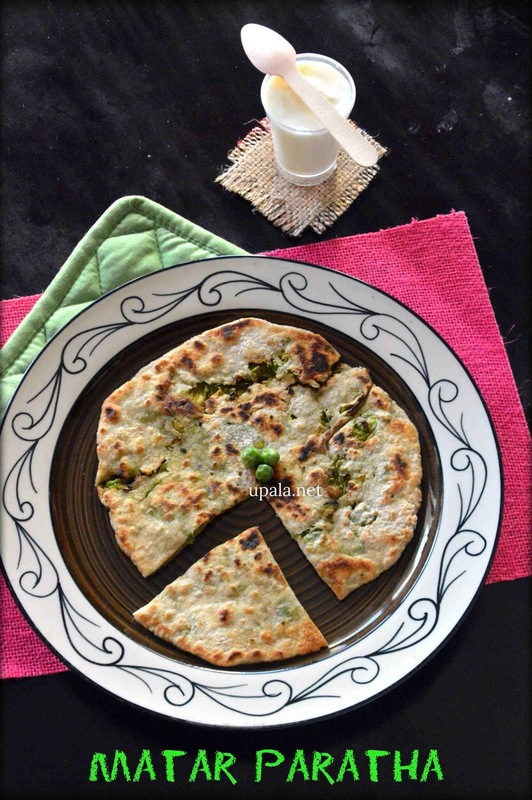 13) Now drizzle some oil on sides of paratha, cook for few seconds and flip it around to cook other side. 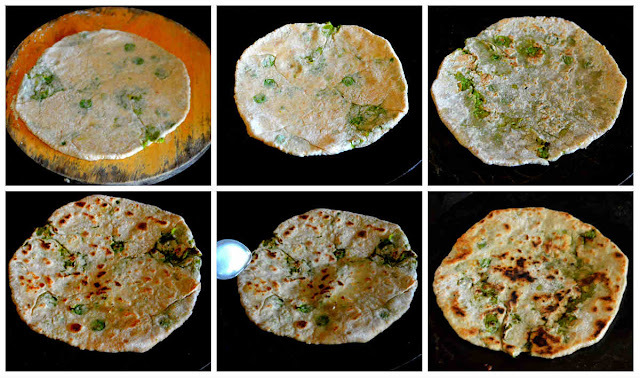 1) Generally for any paratha, leave it to cook for longer time before drizzling oil. After you drizzle the oil, don't leave to cook for a longer time since it might turn hard. Let it cook for few seconds for both the sides and remove from tawa. 2) If you prefer ginger flavour, you can grate few ginger and add to matar stuffing. 3) Some might love to add onions, you can add finely chopped onions after cumin seeds splutters. Then fry for few seconds and add matar mixture. 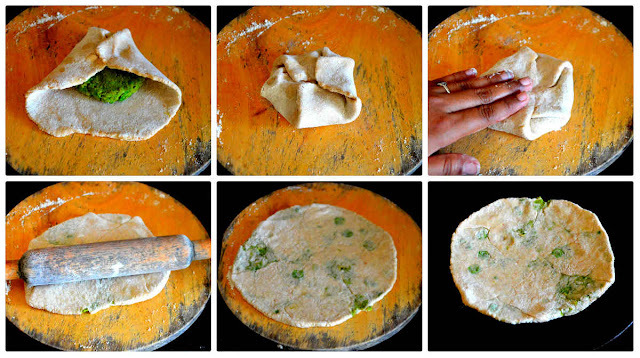 4) You can also add few red chilli powder if you want a more spicy paratha. 5) If fresh peas are not available, you can use frozen ones.